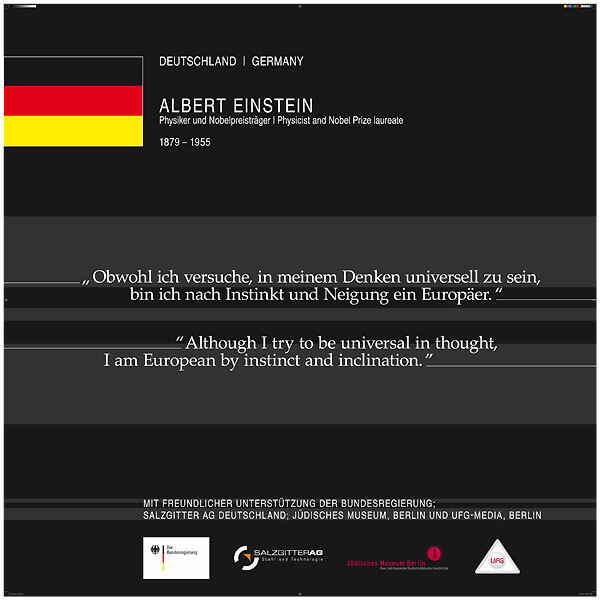 On may 7th 2006 at 5 p.m. during the Europe-Week 06 the PATH OF VISIONARIES in Berlin was opened. In the pedestrian area of Berlins Friedrichstraße 27 illuminated floor displays were arranged to form the PATH OF VISIONARIES. They represent visionary ideas of great Europeans. The former Belle-Alliance-Platz, today Mehringplatz, was named after the liberation wars and emphasised the European nation's quest for sovereignty in a particular manner. Through a contemporary interpretation of the historical meaning of this place, the Plaques Of The Nations were installed for each country of the European Union. In May 2008 the PATH OF VISONARIES will be lit from underground. It will then become an illuminated path leading through the pedestrian zone of the Friedrichstraße.